"Restore all things in Christ!" WeShare - How Does it Work? The Knights of Columbus was started in the basement of St. Mary’s Church New Haven, Connecticut in 1882 by a Parish Priest by the name of Michael Joseph McGivney. The Catholic fraternal order was founded to assist the struggling Catholic Families in his Parish. From humble beginnings the fraternal order has blossomed into 14,000 Councils with 1,000,800 members worldwide. The “Knights” this past year donated 167.5 Million to Charity and volunteered over 70 Million hours of their time to service. 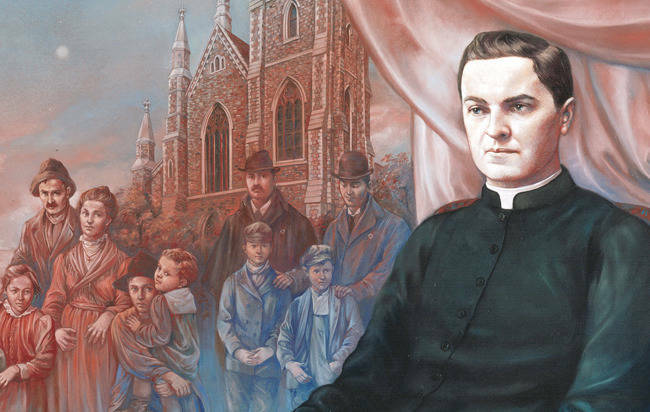 Pope Benedict XVI approved a decree recognizing the heroic virtue of Father McGivney. This act furthered the process of Father McGivney in becoming the first American-born Priest to be canonized. How many fraternal organizations have a Saint as a founder? The Knights of Columbus have been described as the right arm of the Catholic Church. If you are 18-years or older and a practical Catholic you too may be a Knight of Columbus. 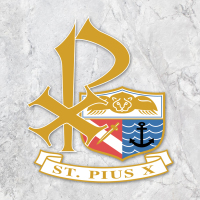 St. Pius X Council #10332 is a small but very busy Council within the Knights of Columbus. It was chartered in April of 1990. We meet every 2 & 4th Thursday at 7:30PM in Room #1 of the St. Pius X School Building. All of our business meetings begin with a prayer and end with a prayer. We do a “Gourmet Pancake Breakfast Fundraiser” twice a year-proceeds go to a host of charities in support of our Church, Church Ministry’s, Seminarians, and Community. We collect and distribute non-perishable food for local pantries. As a Council we come together and perform the “Stations of the Cross” on Good Friday. We attend the Pro-life Mass at St. Patrick’s Cathedral, the “March for Life” on route 110 in Huntington, and a “Prayer Rally” in Albany. Our K.I.N. (Knights In Need) committee assembles a list of our sick and Council members in need. We perform a “Council Prayer Service” for all our departed brothers at their wake service. We have a “Council Memorial Mass” where our departed brother’s names are read. We are your Ushers at Mass. We hold a Basketball “Free Throw” competition for the kids and each child receives a certificate and patch. All winners receive plaques for their participation and a chance to move on in the competition. We march in unity in the Plainview/Old Bethpage Memorial Day Parade. We are the sponsors for the “Wall of Honor” which honors active members of our Parish serving in the Armed Forces. The Council has a Scholarship Aid for children entering a Catholic High School (Awards are presented at our annual Christmas Party). We have a Christmas Tree Lighting Ceremony “Light up for Christ” near the Church and celebrated worldwide on the first Tuesday of December. Socials include: “Family Picnic”, “Christmas Party”, “Belmont Outing”, and a “Communion Breakfast”. Never before in the history of the Catholic Church has it been more important to be a Knight. Special interest groups, politicians with their own agenda, and secular progressives have all sent notice that they are out to change our Christian way of life. Attacks on the unborn, Christmas, R.C. Church, and Clergy have escalated to unbearable heights. The “Knights of Columbus” are here to make sure that a way of life we all grew up with and cherish does not disappear. We are here to make a difference in people’s lives. The K of C offers a Best AAA rated life insurance, extended care, and annuity policies. There are Scholarships and Scholarship Aid available for CCD, Catholic Regional Elementary School, and College. With a K of C membership card you may enter any K of C building and attend any meetings/functions worldwide. We offer you a chance to learn more about your Faith and we offer you a chance to become part of a brotherhood of Catholic gentlemen dedicated to our Faith, Family, Community, and Country. ©2019 St. Pius X RC Church, Plainview NY All Rights Reserved.